Joe Iconis, Composer, Producer - Kurt Deutsch, Producer - 'Be More Chill' Band, Vocals - Charlie Rosen, Producer - Be More Chill, MainArtist Copyright : 2015 Two River Theater Company. Under exclusive license to Ghostlight Records. 2015 Two River Theater Company. Under exclusive license to Ghostlight Records. Will Connolly, Vocals, MainArtist - Joe Iconis, Composer, Producer - Kurt Deutsch, Producer - George Salazar, Vocals, MainArtist - Charlie Rosen, Producer - 'Be More Chill' Ensemble, Vocals, MainArtist Copyright : 2015 Two River Theater Company. Under exclusive license to Ghostlight Records. 2015 Two River Theater Company. Under exclusive license to Ghostlight Records. Joe Iconis, Composer, Producer - Kurt Deutsch, Producer - Charlie Rosen, Producer - Stephanie Hsu, Vocals, MainArtist Copyright : 2015 Two River Theater Company. Under exclusive license to Ghostlight Records. 2015 Two River Theater Company. Under exclusive license to Ghostlight Records. Joe Iconis, Composer, Producer - Kurt Deutsch, Producer - Gerard Canonico, Vocals, MainArtist - Charlie Rosen, Producer - 'Be More Chill' Ensemble, Vocals, MainArtist Copyright : 2015 Two River Theater Company. Under exclusive license to Ghostlight Records. 2015 Two River Theater Company. Under exclusive license to Ghostlight Records. Will Connolly, Vocals, MainArtist - Joe Iconis, Composer, Producer - Kurt Deutsch, Producer - George Salazar, Vocals, MainArtist - Charlie Rosen, Producer Copyright : 2015 Two River Theater Company. Under exclusive license to Ghostlight Records. 2015 Two River Theater Company. Under exclusive license to Ghostlight Records. Will Connolly, Producer - Eric William Morris, Vocals, MainArtist - Joe Iconis, Composer Copyright : 2015 Two River Theater Company. Under exclusive license to Ghostlight Records. 2015 Two River Theater Company. Under exclusive license to Ghostlight Records. Will Connolly, Vocals, MainArtist - Eric William Morris, Vocals, MainArtist - Joe Iconis, Composer - 'Be More Chill' Ensemble, Vocals, MainArtist Copyright : 2015 Two River Theater Company. Under exclusive license to Ghostlight Records. 2015 Two River Theater Company. Under exclusive license to Ghostlight Records. 8 Do You Wanna Ride? Joe Iconis, Composer, Producer - Kurt Deutsch, Producer - Charlie Rosen, Producer - Lauren Marcus, Vocals, MainArtist - Katlyn Carlson, Vocals, MainArtist Copyright : 2015 Two River Theater Company. Under exclusive license to Ghostlight Records. 2015 Two River Theater Company. Under exclusive license to Ghostlight Records. Will Connolly, Vocals, MainArtist - Eric William Morris, Vocals, MainArtist - Joe Iconis, Composer, Producer - Kurt Deutsch, Producer - Charlie Rosen, Producer - 'Be More Chill' Ensemble, Vocals, MainArtist Copyright : 2015 Two River Theater Company. Under exclusive license to Ghostlight Records. 2015 Two River Theater Company. Under exclusive license to Ghostlight Records. Will Connolly, Vocals, MainArtist - Joe Iconis, Composer, Producer - Kurt Deutsch, Producer - Charlie Rosen, Producer - 'Be More Chill' Ensemble, Vocals, MainArtist Copyright : 2015 Two River Theater Company. Under exclusive license to Ghostlight Records. 2015 Two River Theater Company. Under exclusive license to Ghostlight Records. Joe Iconis, Composer, Producer - Kurt Deutsch, Producer - Charlie Rosen, Producer - 'Be More Chill' Ensemble, MainArtist - Stephanie Hsu, Vocals, MainArtist - Chill Ensemble, Vocals - Be More Chill, MainArtist Copyright : 2015 Two River Theater Company. Under exclusive license to Ghostlight Records. 2015 Two River Theater Company. Under exclusive license to Ghostlight Records. Will Connolly, Vocals, MainArtist - Eric William Morris, Vocals, MainArtist - Joe Iconis, Composer, Producer - Jake Boyd, Vocals, MainArtist - Kurt Deutsch, Producer - Charlie Rosen, Producer - 'Be More Chill' Ensemble, Vocals, MainArtist - Stephanie Hsu, Vocals, MainArtist - Lauren Marcus, Vocals, MainArtist Copyright : 2015 Two River Theater Company. Under exclusive license to Ghostlight Records. 2015 Two River Theater Company. Under exclusive license to Ghostlight Records. Joe Iconis, Composer, Producer - Kurt Deutsch, Producer - Charlie Rosen, Producer - 'Be More Chill' Ensemble, Vocals, MainArtist Copyright : 2015 Two River Theater Company. Under exclusive license to Ghostlight Records. 2015 Two River Theater Company. Under exclusive license to Ghostlight Records. 15 Do You Wanna Hang? Joe Iconis, Composer, Producer - Kurt Deutsch, Producer - Charlie Rosen, Producer - Katlyn Carlson, Vocals, MainArtist Copyright : 2015 Two River Theater Company. Under exclusive license to Ghostlight Records. 2015 Two River Theater Company. Under exclusive license to Ghostlight Records. Joe Iconis, Composer, Producer - Kurt Deutsch, Producer - George Salazar, Vocals, MainArtist - Charlie Rosen, Producer Copyright : 2015 Two River Theater Company. Under exclusive license to Ghostlight Records. 2015 Two River Theater Company. Under exclusive license to Ghostlight Records. 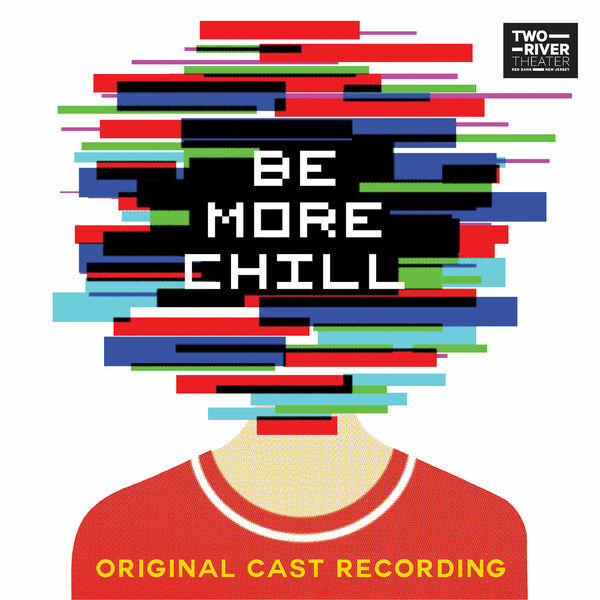 Joe Iconis, Composer, Producer - Kurt Deutsch, Producer - Charlie Rosen, Producer - 'Be More Chill' Ensemble, Vocals, MainArtist - Lauren Marcus, Vocals, MainArtist - Katlyn Carlson, Vocals, MainArtist - Katie Ladner, Vocals, MainArtist Copyright : 2015 Two River Theater Company. Under exclusive license to Ghostlight Records. 2015 Two River Theater Company. Under exclusive license to Ghostlight Records. Eric William Morris, Vocals, MainArtist - Joe Iconis, Composer, Producer - Kurt Deutsch, Producer - Charlie Rosen, Producer - 'Be More Chill' Ensemble, Vocals, MainArtist Copyright : 2015 Two River Theater Company. Under exclusive license to Ghostlight Records. 2015 Two River Theater Company. Under exclusive license to Ghostlight Records. Paul Whitty, Vocals, MainArtist - Joe Iconis, Composer, Producer - Kurt Deutsch, Producer - George Salazar, Vocals, MainArtist - Charlie Rosen, Producer Copyright : 2015 Two River Theater Company. Under exclusive license to Ghostlight Records. 2015 Two River Theater Company. Under exclusive license to Ghostlight Records. Joe Iconis, Composer, Producer - Kurt Deutsch, Producer - Charlie Rosen, Producer - 'Be More Chill' Ensemble, Vocals, MainArtist Copyright : 2015 Two River Theater Company. Under exclusive license to Ghostlight Records. 2015 Two River Theater Company. Under exclusive license to Ghostlight Records. Distributed by New Razor & Tie Enterprises LLC d/b/a "Razor & Tie Recordings" via Concord Music Group Inc.
© 2015 Two River Theater Company. Under exclusive license to Ghostlight Records. 2015 Two River Theater Company. Under exclusive license to Ghostlight Records.